Spring in New England this year has seen a series of wild temperature swings. Easter weekend saw temperature topping 85º during the day and dropping down to the mid-40’s at night. With the trend clearly heading higher—farewell, never-ending Winter conditions—activities in the RainyDayGarden have kicked up a few notches. To make sure the birds have plenty of fuel for all they need to do this time of the year (nest building, egg laying, and the like), we have been putting out plenty of feed, along with Cole’s new Terrific Tube Feeder, right in the middle of the action. 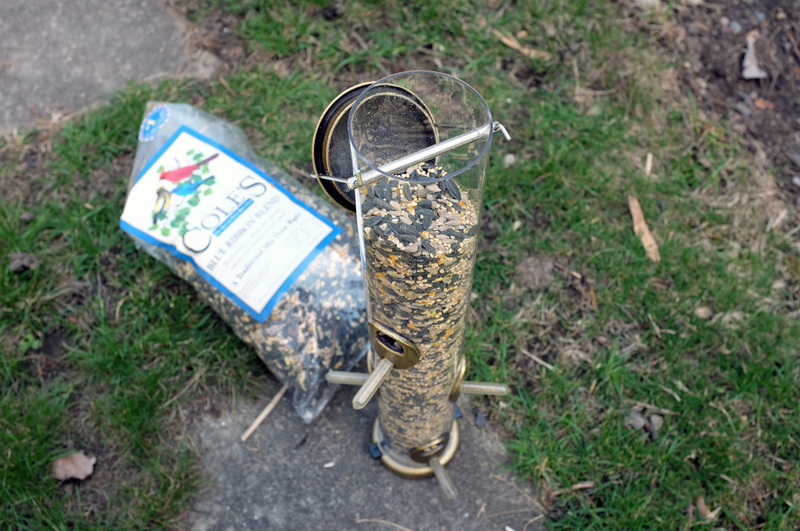 We stock the tube feeder with Cole’s Blue Ribbon Blend. That feed has a good mix of black oil sunflower, sunflower meats, white proso millet, cracked corn, and canary seeds. 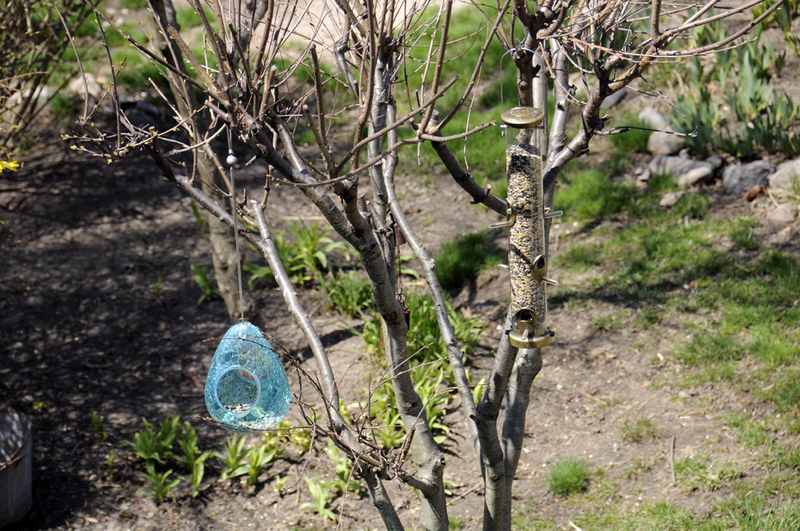 The glass feeder from Gardener’s Supply Company, with its large opening, is perfect to use with Cole’s Nutberry Suet Blend. Its chunks of fruits and larger pieces would not work with the tube feeder’s smaller openings. The “secret” of the new feeder did not stay quiet for long. 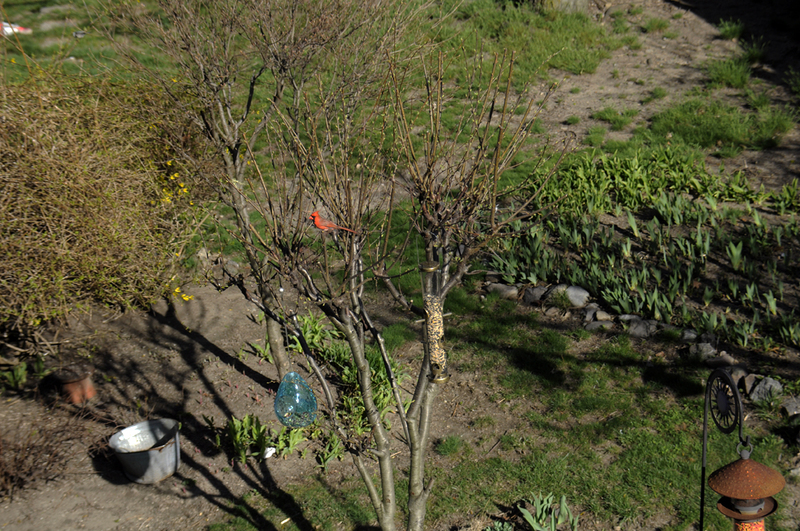 Soon the cardinals wanted in on the action. 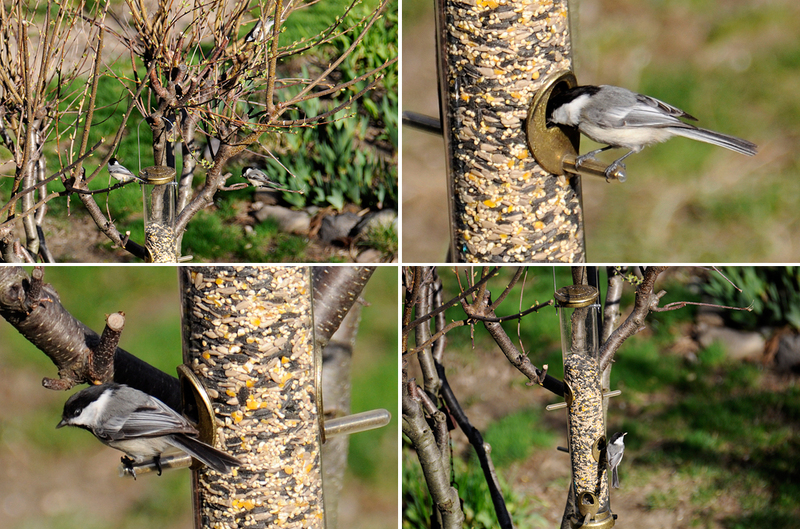 However, much to their disappointment, they were a little too large to easily feed on the tubular feeder. They will just have to wait their turn at the open buffet three feet away. Spotted along with the chickadees at the new feeder was a Tufted Titmouse. That shouldn’t be surprising as it is a cousin to the chickadee. 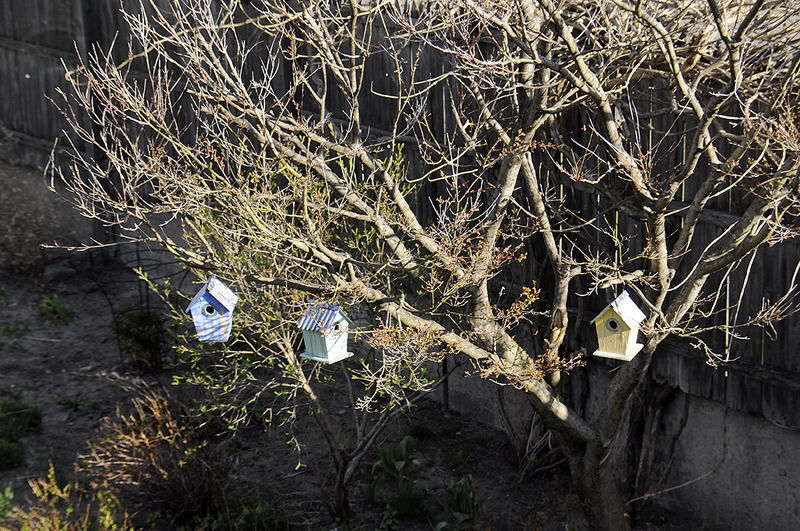 A few years back, we got some birdhouses from Gardener’s Supply Company. Ours have been outside for four years, and aside from the paint flaking, have held up to everything New England weather threw at them. These really well-constructed units have been lovely additions to the RainyDayGarden, even though none of our feathered visitors took to them as dwellings. We are not sure if the new feeder has anything to do with it, but we finally spotted some activity in the bird houses this year. The bird we saw poking its head out was a Black-capped Chickadee!!! We spotted it popping in and out, with a tuft of something in the beak, and appears to be building something in there. We are hopeful that more will take to these wonderful and sturdy units going forward! As luck with have it, we got in a new piece of Fujinon gear which has been perfect for keeping an eye on the chickadee’s nesting progress. 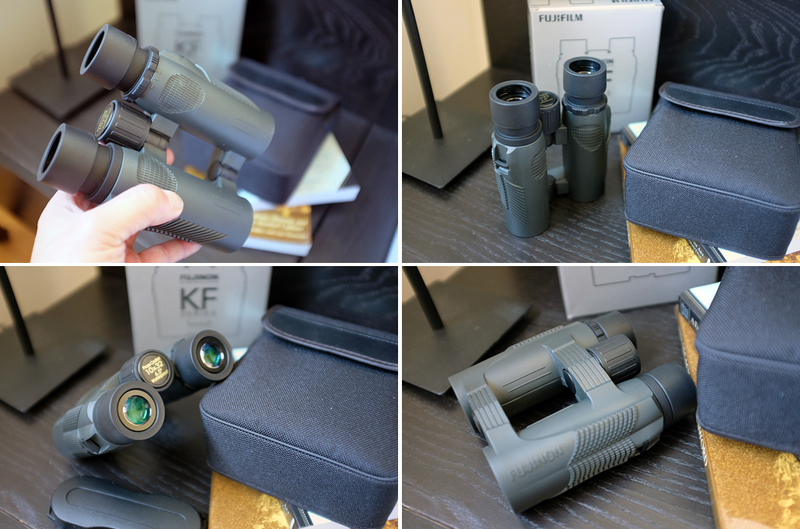 Back in January, we introduced RainyDayMagazine readers to Fujinon’s KF series of binoculars. We brought that unit along with us to this year’s Merrimac Eagles Festival. 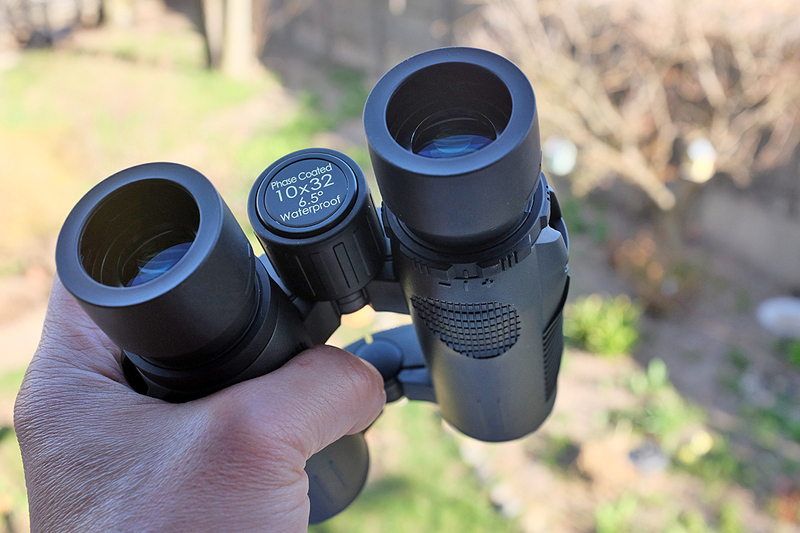 While the Fujinon KF 10×42 unit would work well, the smaller 10×32 pair of binoculars is perfect for backyard birding. The view through these Fujinon binoculars are tack-sharp and VERY contrast-y. The light weight makes them easy to grab for that quick look out the window. The smaller size means that they won’t take up much room on the night stand or even right on the window sill. We will, of course, take these new Fujinon binoculars out into the field the next chance we have to see if they perform as well as its bigger brother. If the FirstUse of the 10×42 unit is any guide, a smaller and lighter version may prove to be even more suitable for our “Urban Safari” needs than its beefier sibling! More on the Fujinon soon.